← Dressing Up – My Favourite Thing! What a week it’s been! I’ve shared stories about my cats, my granny and my love of dressing up, all the while managing (barely) to watch Rafa lose his match at Wimbledon as well as witness the spectacular crash and burn of one Andy Murray. One or two of us have shared running commentaries on this sorry subject, so I know I’m not the only one whose week has been one big balancing act. It is fitting then, I think, to be able to end the week on a high because I have some exciting news to share with you, which is to say that two of my poems have been published in an anthology! It hasn’t sunk in yet and I can’t quite believe it! 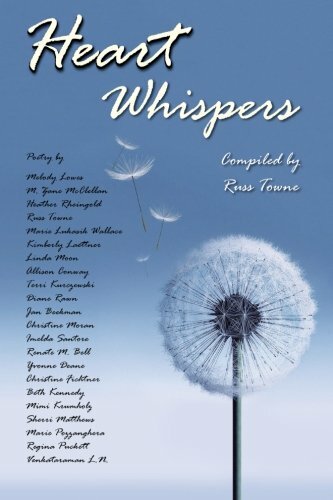 Compiled by my blogging friend Russ Towne, Heart Whispers is available now on Amazon.com and Amazon.co.uk. For those of you who might be interested, Michael over at M. Zane McClellan (Poetry Channel) shares his production of the beautiful preview video of Heart Whispers (only 3 minutes long!). This is the first time, ever, that I’ve had any writing published in a book, and I am truly honoured to have my poems appear alongside so many wonderful, talented poets, a couple of whom are fellow bloggers and friends. Thank you so much Russ for making the publication of this beautiful anthology possible. But none of this would have happened if it wasn’t for you, my dear friends (and family!) who have given me the confidence to go this far with my writing. I was so scared the first time I posted a poem here, thinking I would be laughed out of blogland, but instead you have given me the best gifts a writer could receive – the space for creative freedom, the breathing room for the raw expression of some of my deepest and darkest thoughts, and the inspiration to explore forms of poetry I didn’t even know existed. On top of all that, you have given me the courage to keep going. So I thank you all from the bottom of my heart. Who would have thought that all those years ago on this date, barbecuing on a beach with my children and watching fireworks somewhere on the Central Coast of California, that on this 4th of July back here in the UK, I would be blogging about my first ever poetry publication? Life can bring hardship, pain and loss but it can also bring joy, hope and the realisation of long-held dreams. 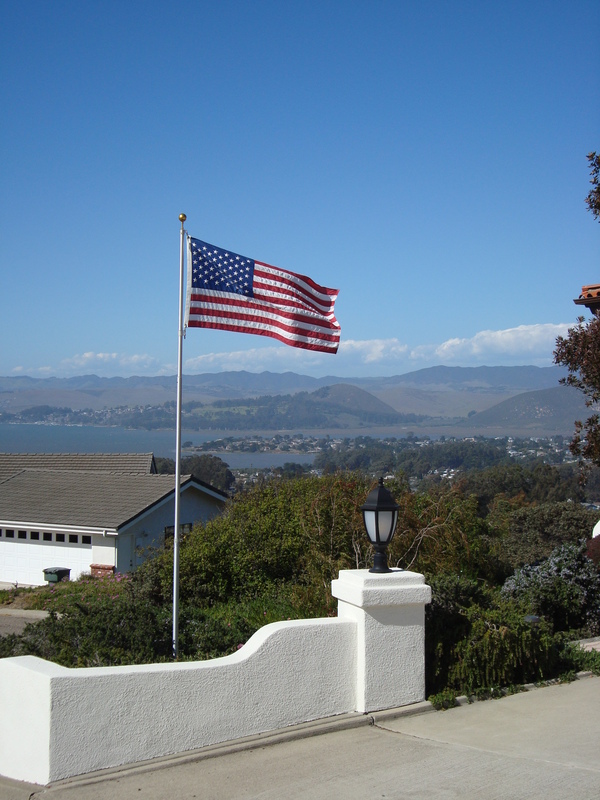 View from the heights of Los Osos overlooking Morro Bay, California, Spring 2013. Finally then, in remembering those precious family gatherings from a distant past, I wish all my dear American friends today a very Happy 4th of July. I celebrate with you on your independence day and raise a glass to a star-spangled future for us all. This entry was posted in Blogging, Writing Updates and tagged Blogging, California, Celebrations, Heart Whispers, July 4th, Poems, Poetry Anthology, Publication, thank you, Wimbledon, World Cup, Writing Updates. Bookmark the permalink. You have some great poems Sherri. Add a few choice photos – voila! Look at Blurb for self-publishing though there are many others. You have always been so encouraging of my poetry (and my photos!) Jude, and that means such a lot. I will take a look at Blurb as I do have a few ideas rummaging about in my mind, whilst trying to get my book written….ha! Catching up now just finished watching the men’s final. Did you see it? Feel quite drained now, a great final but after all the disappointment of the past 2 weeks, I ended up rooting for Federer..so of course he lost! Congratulations Sherri! Your poetry (and stories) so deserve to be published 😀 Cheers!!! Marvellous! So happy for you – how exciting. Enjoy it all. Hope it sells well too – what an accolade. Hooray! Many, many congratulations Sherri, that’s absolutely wonderful news! I’ve ordered my copy so I’ll look forward to reading your poems 🙂 Get the champagne out! Given it is Le Grand Depart demain matin (as they say in Harrogate), I say ‘Chapeau, Sherri’ (or perhaps, just this once, Cheri) for you poetry success. Hope it is the first of many. So happy for you Sherri! I feel that this is just the start of many wonderful things to come! YOWZA!!!!!!!!!!!!!!!!! Oh Sherri, I’m sooooooooooooo happy for you! DFD and I are doing the happy dance for you! Hugs and Kisses to you! We’re sending a bottle of bubbly(or two) across the pond! Great news about the book … now when are you going to do your own???? Many congratulations! That’ wonderful news and very exciting. So how many copies are you planning to buy for friends? Applause, applause, applause! Congratulations. Enjoy your success! Ha, yeah, I think it’s best not to mention England in the World Cup 😉 The USA getting further than us in the competition is a bit of a kick in the teeth, considering they don’t really care about football. But well done to them, anyway! They deserved it more than we did, clearly. It is certainly crazy where life can take you. Crazycrazyyyyy. But it’s all part of the ride, no? Magnificent! 🙂 I shall go there promptly and read. Well done, lovely lady! I was cheering Fed too so we’ll share the blame. 🙂 Coming second was no disgrace today. Thanks Sherri. Your thoughts are reciprocal. Amazing how across the hemispheres we have found a friendship that is so valuable. Lovely post, great news, gorgeous photos. Thank you, Sherri, for your 4th of July wishes. But moreover, bravo for making it to the anthology. Great ending to a busy week. See you soon. That’s brilliant, very well done, Sherri! Many congratulations on being published!!! This pleases me greatly. On the football thing, Seattle Sounders were averaging crowds of over 40,000 that last season so it really is kicking off, so to speak. I look forward to it getting bigger and to catching a game or two over there. I am hoping to be back over there in a few months…finances are a tad tight but that shouldn’t stop me…all that tipping though. blimey that’s a culture shock. Congratulations on having your poetry published! woo hoo – congrats on the book – I also watched the vid- and even though my book list is already a bit long, I think I may just have to splurge on this later this summer – to support the efforts – but it also looks really good! and poetry books (when good) can be enjoyed again and again – and so I will keep you posted. and thanks for the nice comment on my blog – 🙂 made my day – and even though I am taking a blogging break til labor day – I am still checking blogs while out and about – and oh Sherri – we were out driving somewhere when I saw your “dress up” post and I was LMAO – it was so fun – esp. the red glasses and the b & w dress. just fun. so I will still be around – I just wanted a break from posting – and wanted to change things up a bit. Ahh…well, it means a lot that you would take the time to come over here Y when I know you’re taking a break. Thanks so much, really love it when I know that somebody enjoys my posts and gets a good laugh too, haha 😀 Also that you would think about buying the book, so kind of you. I’m still in shock about it! I got the red glasses and the b&w dress at a joke shop, it’s supposed to be a 60’s outfit. All I needed was the knee-high white boots but couldn’t find those, more’s the pity, LOL!